Will Sunscreen Be Required by Law? I was sitting on the beach outside of our vacation home and observed something that was odd to me. A mom came to the beach with her three kids. She pulled up her beach chair and her three kids aged 3 to 7 ran off towards the water to go play. These were white kids with blond hair and these three kids were tan, really tan. Not only was I concerned that they were not being supervised by the water as their mom tanned, I was concerned about their skin burning. As I sat there slathered with SPF 30 and my kids covered with unscented, hormone free SPF 50 sun block, hats, sunglasses, and sun shirts playing under the sun umbrella. Then I looked around at the other families frequently applying sunscreen, having their kids in hats, sun shirts, sunglasses, some in full length sun clothing and realized that I was concerned for these kids because it was so odd to see kids that were clearly not being protected from the sun. I think that within 10 years applying sun screen and sun protection for children will be required by law. 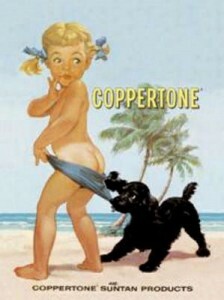 This is a huge bet considering when I was a kid; I was a beautiful golden brown and had the Coppertone tan lines every summer. We spent every waking moment outside playing and swimming in our pool and we were usually only covered with our bathing suits. Why apply sunscreen? We did not burn we had great skin color! Now the dangers of tanning have been exposed, the suns rays are significantly stronger with the loss of the ozone layer than they were when we were kids and medical insurance is seeing the hits from increased visits to dermatologists to remove and treat skin cancer in adults of all ages including me, and my great tanning skin. Why would I bet that this is going to happen? Look at how social pressure to live healthier lifestyles has changed from just pressure to laws in the last 15 years. Seat belts are required by law. It started out as a lesson that schools taught kids to remind us to put on our seatbelt and to pressure our parents to wear their own seatbelts. Now law in most states requires seat belt use. If I see a toddler or young child walking around a vehicle clearly unbuckled, I have no problem calling the police to see if they can stop that vehicle and protect that child in the future. It is not the child’s fault they are not buckled in, it is the parents responsibility. How about smoking, this was another lesson taught to children in schools to go home and teach their parents the dangers of smoking and the dangers of second hand smoke. I have two friends who have children that pressured them out of smoking so I know how well that campaign worked. Now the pressure has changed into a law in Minnesota. We have no smoking laws indoors in Minnesota to protect non-smoking adults and children from second hand smoke, now people can only expose and endanger their children with second hand smoke at home. How is not protecting your children from the harmful rays of the sun not endangering them? It is proven that sun exposure is dangerous and causes skin cancer. Untreated skin cancer can kill you, so why is this something that is not regulated like smoking or seatbelt use or any other neglectful situation that parents put their children in? Parents and caregivers neglecting to apply sunscreen and sun protection to their children can lead to skin cancer. As more skin cancer is treated and medical costs rise for something that is easily preventable with an easily acquired sunscreen lotion or sun block, I believe the simple social pressures to protect our children will become legal requirements to protect our children. Is this idea far out there? I don’t think so. I will be for it to be a law to protect children until they can make their own decision to wear sunscreen or to tan. Feeding fresh produce to your family is an important part of a healthy lifestyle. 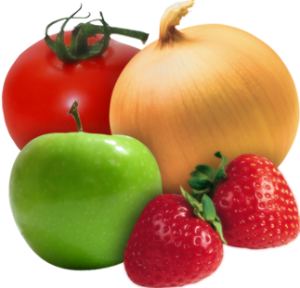 The problem we run into with fresh fruits and veggies and other smooth skinned produce is the chemicals, bacteria, wax, preservatives and pesticides that are on produce. I wondered what was the best way to clean my produce and found this study. According to a study by Cooks Illustrated (and reported by NPR) they tested the different methods to cleaning your produce. They tested bacteria levels when produce was cleaned with a scrub brush, water alone, a Veggie Wash, and vinegar and water soak. They found cheap vinegar wash to be the best at cleaning your produce, it removed 98 percent of the bacteria from the produce! So when you bring home your next grocery cart full of produce, give it a soak in vinegar and water (one part vinegar to three parts water), and then rinse it with cold water to get the vinegar residue off. Vinegar is safe for you, safe for the environment and is cheap too! Like I needed yet another reason for me to buy vinegar by the gallon! To Leash or Not to Leash, That is the Question! Most toddlers go through a very independent stage where they don’t want to hold your hand, but can not understand the dangers of why they can not run off. My son has entered this age. He used to be such a nice, calm boy who would happily hang out with me, but now he is too busy and wants to see everything at his pace, and does not want to be carried or hold onto my hand. We were at the zoo last week and I did not have a stroller because I did not want to drag around an empty stroller so my kids can get some exercise. My son did not want to hold my hand, in fact when I tried to hold his hand he would lean away from me and hang there like dead weight, while I am holding his entire body weight by his wrist so he does not fall to the ground. To avoid walking around the whole day with a child being held up by his arm, I let him walk free. He all of a sudden decided he wanted to go see what was around the corner at his top speed. It is amazing how fast those little legs can move when he wants to! I first tried to slow him down by loudly calling for him to stop, but that did not work. Then I was the mom running after my toddler in public, while trying to make sure my older child follows the pursuit and quickly having to convince her to stop looking at the three banded armadillo and come along. Thankfully he knew that this is not a chase game, he stopped running so I was able to catch him. I got down nose to nose and told him that he has to stay by mom and he cant run away because it is dangerous. Do I think that will be the last time he runs away? Not a chance, I think that I will chase my son occasionally for at least six more months until he is mature enough to understand that he has to stay by mom. It will be the same lesson I had to teach my daughter at the same age. She has learned that she can walk at a safe distance ahead of me but has learned that she has to stay close and be able to maintain eye contact and hear my voice at all times. Unfortunately, my son has not grasped this important safety point yet. We are going to be in an airport in a couple of weeks and I don’t want to lug around a stroller, but I am going through the internal battle if I want to be the parent with my toddler on a leash or not. To clarify, is not really a leash, it is a monkey stuffed animal. 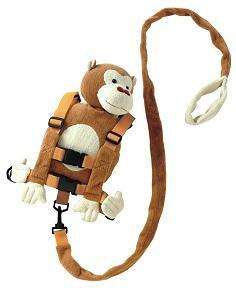 harness, backpack with a four foot tether for an adult to hold onto, in order to keep your child close in public. It slides over his arms and has two buckles to keep it on him, along with adjustable straps and are soft. When you hold onto the tether and they take off, it slows down the child from the chest and the whole torso, not the neck or arm or any other dangerous place, and the stuffed animal monkey makes it look much more friendly to others. Why do I consider not using it? When people who I assume did not have children saw my daughter wearing a harness they laughed or make snide remarks about me treating her like an animal. I know it is not only me who has gotten rude remarks, in public I have hard other people loudly criticize other parents walking around in public with their children wearing a harness as well. I clearly remember one man walking up to a mom asking her if her child has to eat on the floor like a dog too, I was horrified for her. Every new mom receives tons of advice with the birth of your baby, be careful who you listen to. The parenting methods that may have been in style 35 years ago are not appropriate anymore. 35 years ago some pregnant moms smoke, drank, and ate whatever they wanted. Would any responsible pregnant woman risk damage to her fetus by smoking and drinking? No, because research has proven that it is not healthy! You should not use archaic methods of parenting either. Research continually changes the recommendations and the best practices for the healthiest and best ways to care for your babies. Listening to someone who had a baby five years ago can already be outdated, imagine if you are taking advice from someone who has not had a baby in 30 years how outdated that advice is! There are some things that I had people recommend to me that are not only outdated but outright dangerous and maybe even be considered child endangerment or neglect by today’s standards. There are things that people say in passing like put a little whiskey on their gums when they are teething or give them a little Benadryl to sleep on a plane. These things could be are horribly dangerous for a baby. I can’t imagine how many sleep deprived, uneducated parents just give it a try. Always ask your pediatrician before giving your newborn any medications, over the counter remedies and NEVER give your child alcohol! Baby sleep position has changed completely from 30 years ago when parents were told to put babies to sleep on their stomachs, 15 years ago it was put your baby to sleep on their side and use a sleep positioner, now we are supposed to put our babies to sleep in a completely empty crib, with no bumpers, no pillows, no positioners while they are wearing a sleep sack. Research has proven sleeping on their back is now the safest method to prevent SIDS. Car seat safety has dramatically changed, even 5 years ago it was OK to switch your car seat front facing at 1 year and 20 pounds, now it is recommended to keep your seat rear facing until 40 pounds or as long as your car seat will allow it. When I see people using outdated car seats or standard infant seats for a 2 year old with their legs dangling over the edge it makes me want to scream! Don’t use a lap bar or shield booster, they are all recalled or expired and could decapitate your child in an accident. Don’t accept a car seat as a hand me down! Don’t use a car seat that has been in a car accident or was manufactured more than 5 years ago. Car seats are made so much better today than they were 5 years ago, they are easier to use, they are safer. Your child is worth it. It really gets me is when I hear people say, you don’t want to spoil your baby! Don’t hold it too much! Lay down your baby! It has been proven that you can not spoil a newborn, that instead it promotes a healthy self esteem for children to be held. In countries where babies are never put down but are carried constantly, those babies never cry and acid reflux does not exist. Why are there are so many products that are aimed at newborns and under 20 pounds like bassinets, co-sleepers, cradles? It is because developmentally newborns don’t sleep for 8 hours at a time. These products help encourage nursing success because nursing babies digest breast milk faster than formula, and need to be fed every 2-3 hours when they are newborns. Even if you are not breastfeeding, your baby needs you more than you need your sleep at least until they are about 4 months old. Babies poop constantly even at night. You can’t leave a newborn baby laying in their waste all night long. Could you sleep while your feces burns a horrible diaper rash on your sensitive skin? You should not be trying to let a newborn Cry It Out. Leaving your baby to scream and cry for 1 hour until they fall asleep in exhaustion could be considered child neglect, so be careful. Do some research or ask your pediatrician before believing someone who tells you that it is OK to ignore a newborn and let them Cry it Out. After nine months of pregnancy if it leaves you wanting to escape as soon as the baby is born is not healthy. Mothers who do not want to be around their babies may have postpartum depression. You are not supposed to be able to leave your newborn, it is maternal instinct and that instinct was developed through thousands of years to protect children from being abandoned by their parents to die. Don’t believe someone who tells you to go out and have fun and leave your kid right after your baby is born. You need that time to bond with your baby to establish a connection and your milk supply if you are nursing. Don’t believe someone who tells you it is OK to want to leave right after your baby is born, talk to your doctor instead to rule out postpartum depression. Your life has changed, you are the Mom now! You need do the research and find out if you are doing the safest, best things for your baby based upon research. You should not believe someone who gives you advice based upon the way they parented their own children 5 to 50 years ago. When it comes to raising your infant do the research, read parenting books, articles and magazines and talk to your pediatrician.